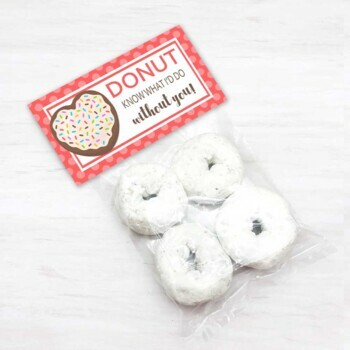 These doughnut treat bag toppers are super cute! They would be great to use for any doughnut/donut themed party, as well as for giving special treats during Teacher Appreciation Week. You will receive 2 different sizes which measure approximately 6.75 x 2.5" and 4.5 x 2.5" when cut and folded. ♦ This is a digital download only, you will not receive a physical copy of the file, or printed papers. Once your payment has been processed and received you will receive a link to download the files right away. While you are here please feel free to look around our shop where you will find a wide variety of printable party favors, and digital scrapbook papers/backgrounds. Bookmark us, and check back often for new items. Thank you for visiting! ♦ The digital download files may not be redistributed, shared, duplicated, forwarded, resold as is in printed or digital format on Etsy, TpT or any other internet platform. Commercial redistribution is prohibited. ♦ This digital download is intended for your PERSONAL USE ONLY.